Camp Jeep® Celebrates 10 Years - Goes Bi-Coastal for 2004! Auburn Hills, Mich., Mar 02, 2004 - Camp Jeep®, the legendary summertime gathering of Jeep owners and enthusiasts, will celebrate its 10th year by doubling the fun and expanding to two locations for 2004. The two events – Camp Jeep 2004 and the first-ever Camp Jeep California – will give East and West Coast Jeep enthusiasts equal opportunity to brush up on their off-road techniques and immerse themselves in the unique Jeep lifestyle. Attendees at both events will have the chance to test out the new Wrangler Unlimited -- a longer, more spacious version of the classic Jeep Wrangler. Plus, they will have a chance to win a two-year lease of a Jeep vehicle, courtesy of Chrysler Financial. The East Coast event, Camp Jeep 2004, will return to last year’s site at the Oak Ridge Estate in the Blue Ridge Mountains of Nelson County, Va., for a three-day run starting on Thursday, July 15. Five weeks later, West Coast Jeep owners will experience Camp Jeep California in the Santa Ynez Mountains near Santa Barbara. Camp Jeep California will run Thursday, August 19 through Saturday, August 21. As an added bonus, attendees at the California event will be the first consumers to test drive the all-new 2005 Jeep Grand Cherokee. One of the most popular highlights of the event is Jeep 101, a series of specially constructed courses designed to teach off-highway driving and safety skills and demonstrate the Trail Rated™ capabilities of the Jeep Wrangler, Liberty and Grand Cherokee. Participants are paired with experienced guides as they negotiate steep grades and tackle challenges such as large rocks, log crossings, sand and other off-highway obstacles. Once they master Jeep capabilities, they have a chance to navigate various levels of 4x4 trails in their own Jeep vehicles. Camp Jeep 2004 and Camp Jeep California also will feature a wide range of lifestyle and family activities including live musical performances. Details on entertainment will be released in a future announcement. Approximately 2,500 vehicles are expected to be registered for Camp Jeep 2004 in Virginia, and another 1,500 vehicles are anticipated for Camp Jeep California. To date, approximately 70,000 people from 48 states have attended Camp Jeep. The event has sold out each year. From 1995-1998, Camp Jeep was held in Camp Hale, Colo. From 1999-2001, Camp Jeep was located at Oak Ridge Estate in Nelson County, Va. For 2002, Camp Jeep set up at the Bar W Ranch near Branson, Mo. It returned to Oak Ridge in 2003. Camp Jeep is one of several owner-loyalty programs created by the Jeep division of Chrysler Group. Jeep Jamborees, which began in the 1950s, are the original off-highway vacation. From the Maine Mountains to the famed Rubicon Trail, approximately 7,000 owners participate in the more than 30 Jamborees held each year. The excellent response to Camp Jeep led to the spin-off of Jeep 101. Jeep 101 driving courses are offered in cities across the nation to provide owners and prospective owners basic skills of safe, yet adventurous off-road driving. 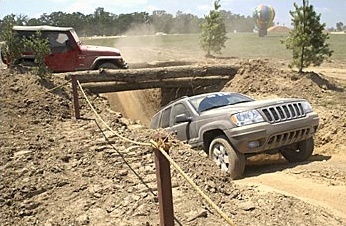 For more information about Camp Jeep visit the Jeep website Jeep.com/campjeep or call 1-800-789-JEEP. Registration for each event is $335 and is open now; “early birds” who register for Camp Jeep California by May 15 will earn a $60 discount off the standard fee.